Centsible Savings: Cheap Milk and Cookies at Kroger! 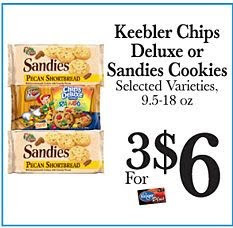 Keebler Chips Deluxe or Sandies Cookies are on sale for $2.00 and Keebler Fudge Shoppe Cookies are on sale for $1.75 each. There have been coupons found on each package for $2.00 off 2 packages. Or you could use the $1.00/2 coupon from 8/2 SS. BUT it gets even better! There is an in-ad special of "Buy 3 participating Kellogg's items get a FREE gallon of milk" (limit 2 rewards per customer). There are other participating Kelloggs/Keebler products - check your ad or store for more details.